Heat oven to 350°F. In large bowl, break up 1 roll of cookie dough. Stir or knead in 3/4 cup of the oats, 1/3 cup of the brown sugar and 1 teaspoon of the vanilla until well blended. With floured fingers, press mixture evenly in bottom of ungreased 13x9-inch pan to form crust. Bake 13 to 18 minutes or until light golden brown. Meanwhile, in same bowl, break up remaining roll of cookie dough. Stir or knead in remaining 1 cup oats, 1/3 cup brown sugar and 1 teaspoon vanilla until well blended. In large heavy saucepan, heat caramels, butter and condensed milk over medium-low heat, stirring frequently, until caramels are melted and mixture is smooth. Spread caramel mixture evenly over crust. Crumble remaining dough mixture evenly over caramel. Bake 20 to 25 minutes longer or until light golden brown. Cool 1 hour. Run knife around sides of pan to loosen bars. Refrigerate 1 hour or until firm. 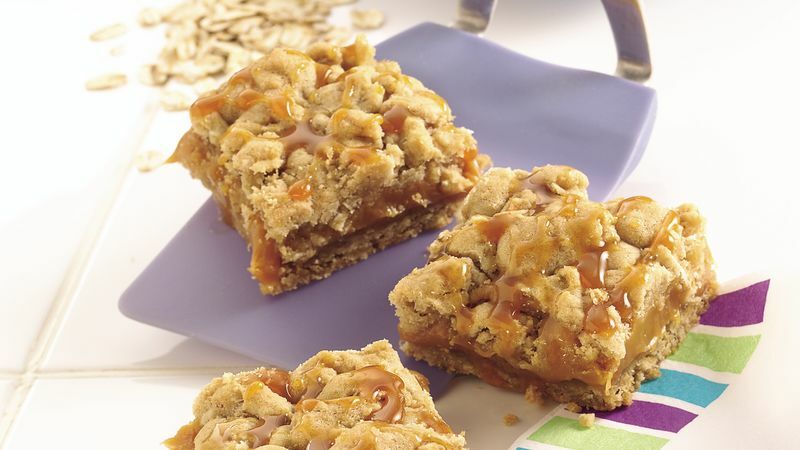 With small spoon, drizzle caramel topping over bars. For bars, cut into 8 rows by 6 rows. Store in refrigerator.